Dwight Jay Osgood, 37, made his first appearance in court on Wednesday on murder charge in connection with the shooting death of his girlfriend Kary Dill in Clifton. A Clifton man charged with murder in connection with the shooting death of his girlfriend made his first court appearance Wednesday at the Penobscot Judicial Center in Bangor. Dwight Jay Osgood, 37, was not asked to enter a plea because he has not yet been indicted by the Penobscot County grand jury. The grand jury next convenes on Jan. 30. Osgood, who goes by his middle name, allegedly shot and killed his live-in girlfriend, Kary Dill, 35, according to the Maine State Police. Her body was found Monday at the home they shared on Route 9, also known as Airline Road, next to the Clifton General Store, where Dill worked. 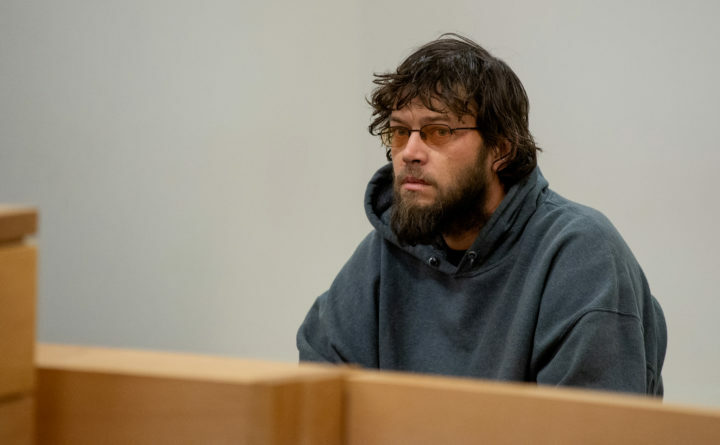 Osgood and Dill had lived together about four years, Stephen McCausland, spokesman for the Maine Department of Public Safety, said Tuesday after Osgood was arrested. Superior Court Justice William Anderson on Wednesday found there was probable cause to charge Osgood with the murder. The judge ordered that he be held without bail at the Penobscot County Jail. Anderson also ordered the affidavit and search warrants in the case sealed. The case is expected to classified as a domestic violence homicide. A trial date is not expected to be set for several months. Neither Assistant Attorney General Robert “Bud” Ellis, who is prosecuting the case, nor the defense team of Jeffrey Toothaker and Robert Van Horn, both of Ellsworth, spoke to the media after the brief hearing. A post on the Facebook page for the Clifton General Store called Dill “an amazing employee and an even better person. “She always had a smile on her face and never let life get her down. We will miss her deeply,” the post read. Reed said that on Monday morning word quickly spread through the small town that a lot of police cars were outside the home next door to the store. Residents, including Reed’s boyfriend, watched as detectives with the Maine State Police removed Dill’s body from the house. If convicted, Osgood faces 25 years to life in prison on the murder charge.